Perfume vials from Christ’s Era Unearthed in Israel. Archaeologists excavating in the biblical town of Magdala, on the Northwestern shores of Galilee, have unearthed vials of perfumed ointments. The vials (known as Unguentarium) had been preserved intact at the bottom of a 1st century pool. The contents are been chemically analyzed and perhaps will give us an insight into 1st century perfumes, ointments and cosmetics. News reports are linking the perfume vials with the New Testament story of the anointing of the feet of Jesus by a woman named as Mary (John 11:2, 12:3). The name Mary is used 54 times in the New Testament and there are several different Mary’s mentioned; Mary, the mother of Jesus (19 times), Mary Magdalene (13 times), Mary, sister of Martha (11 times), Mary, mother of James (9 times), and Mary, mother of John Mark (1 time). The anointing of the feet of Jesus as recorded in the gospels may be two accounts of the same event or two reports of separate events. But, what is clear is Mary Magdalene is not to be identified as the Mary in the gospel passages. There is every possibility that Mary of Magdala may have had perfumed ointments. Perhaps even stored them in similar vials but that’s the extent of the connection to this remarkable discovery. I have driven by the sparse remains of Magdala many times and just wondered when someone would launch more excavations at the site. I am thrilled that the Italians are at the site, on the job and on the ball (or on the vial). 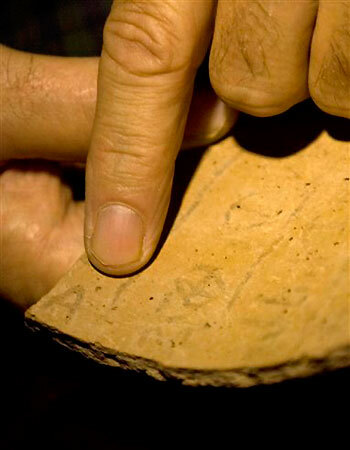 on December 15, 2008 at 6:17 pm Comments Off on Perfume vials from Christ’s Era Unearthed in Israel. KHIRBET QEIYAFA, Israel— “Overlooking the verdant Valley of Elah, where the Bible says David toppled Goliath, archaeologists are unearthing a 3,000-year-old fortified city that could reshape views of the period when David ruled over the Israelites. Five lines on pottery uncovered here appear to be the oldest Hebrew text ever found and are likely to have a major impact on knowledge about the history of literacy and alphabet development. Without going into a long arduous discussion of the two major positions (minimalist and maximalist) archaeologists take regarding the historical reliability of the Hebrew Bible and Christian Scriptures, let me simply state that the former is the dominant view in the lands of the Bible. Therefore, on a regular basis when discoveries, interpretations, and analyses of archaeological materials run countercultural to the majority view they are met with denial, forced re-analysis, and loud public statements of just how wrong the “other guys” are. Perhaps the majority view isn’t right after all. Who stands to lose the most when evidence compatible with the Biblical record is laid on the table? Again, the long search for collaborative evidence for King David’s magisterial reign, as outlined in the Bible, has taken another possible step forward with the discovery of these ostraca. Finally, this note to remember: the absence of evidence is not the evidence of absence. I couldn’t be more thrilled for anyone. I recall my first meeting with Doron, it was on the acropolis at Tel Hazor, northern Galilee, where he faithfully served as an associate of Dr. Amnon Ben Tor. He wore many hats, and wore them well, yet he was accessible as an human being to enthusiastic neophytes. He was so patient with my sophomoric questions, with which I bombarded him periodically over several dig seasons at Hazor. He soon became more than a square supervisor; he became a friend. His assignment as the chief archaeologist on one of the most important digs in Jerusalem( Giv’ati Car Park at the city of David, in the “Walls around Jerusalem National Park”) is well deserved and his faithfulness to work for others is now being rewarded. It was an honor to spend one day working at his site in July 2007. My colleague, Dennis Malone, joined Doron’s volunteer dig team for several weeks in 2007; his wife Mary and Patti Stenger also spent a day “washing pottery” from the site. The articles below highlight just one example of exciting discoveries at this impressive site. 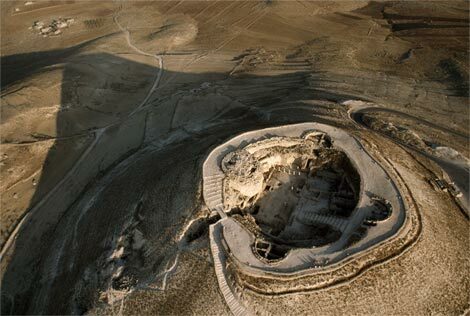 Credits: “Skyview”, courtesy of the Israel Antiquities Authority. 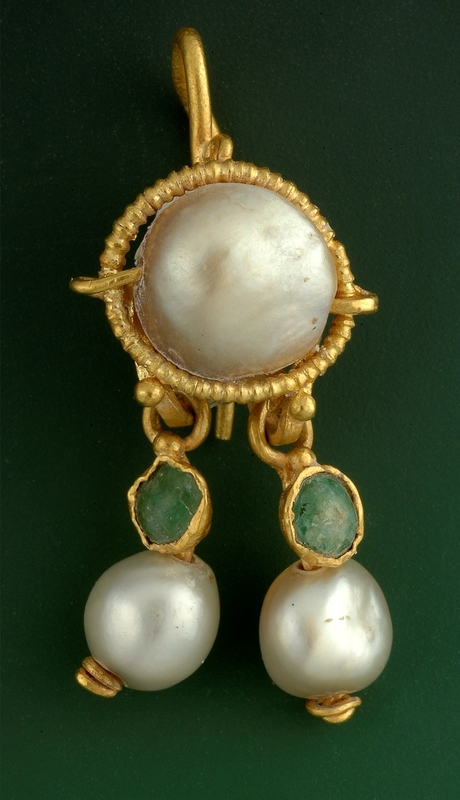 Picture of the earring, Clara Amit, courtesy of the Israel Antiquities Authority. I have been having trouble getting computer time at the hotels we are staying in. There are too few computers in the business centers and because it is Holy Week there are tens of thousands of Pilgrims in the country and they all want access to the computers; even WiFi isn’t reliable. But it looks like I got a strong signal tonight so I better get at it. We have travelled from Caesarea Maritima on the coast, north to Mt. Carmel (Elijah’s stomping grounds), eastward to Meggido (possible stage for yet another great battle), northward again to Nazareth (home town of Jesus, with a population of approximately 150-200 people in his day), and eastward again to the Sea of Galilee (really a fresh water Lake 15 x 9 miles). The Sea of Galilee is struggling to survive as a serene and commercially viable source for fish and drinking water. This is so evident when you have been able to visit the Galilee over the past several years. I was shocked. The entire region is struggling with what will become a serious crisis if measures are not taken to correct it. The waters are not as clear, fresh & colorful as before. Pollution and algae are to blame. The natural flow has been interrupted , the Jordan has virtually been halted; little water flows southward. The government allows enough to keep water flowing into an area where there are Christian Baptismal service going on regularly. This may bring in the shekels but its bad move for the vitality of the Jordan. We traveled north from Galilee into the Upper Galilee and got a first hand look at the fertile lands created after the draining of Lake Hulah in the 1950’s. Between the Jezreel Valley and this region we have a large section of the “bread -basket of Israel. This is a war scarred region too. In the recent war with Lebanon small communities in the north (Metulah and Kiryat Shmona) were repeatedly shelled. The greatest damage was from Forrest fires caused by the rocket salvos. We travelled up snow capped Mt. Hermon , down the Golan Heights and back to the north end of the Sea of Galilee (Capernaum, Tabgha, Bethsaida, and Magdala) where Jesus conducted nearly 70% of his public ministry. This is the time of climatic transition, from the wet to dry seasons. The temperatures have been very warm, actually hot (96) at Masada. Speaking of climate and wet/dry seasons I must say I am completely amazed at just how green everything is during the rainy season. Those regions in the Jordan rift valley and the Wilderness of Judah which are usually bleak, brown and lifeless to the eye are now green and look fertile. What a difference water makes! 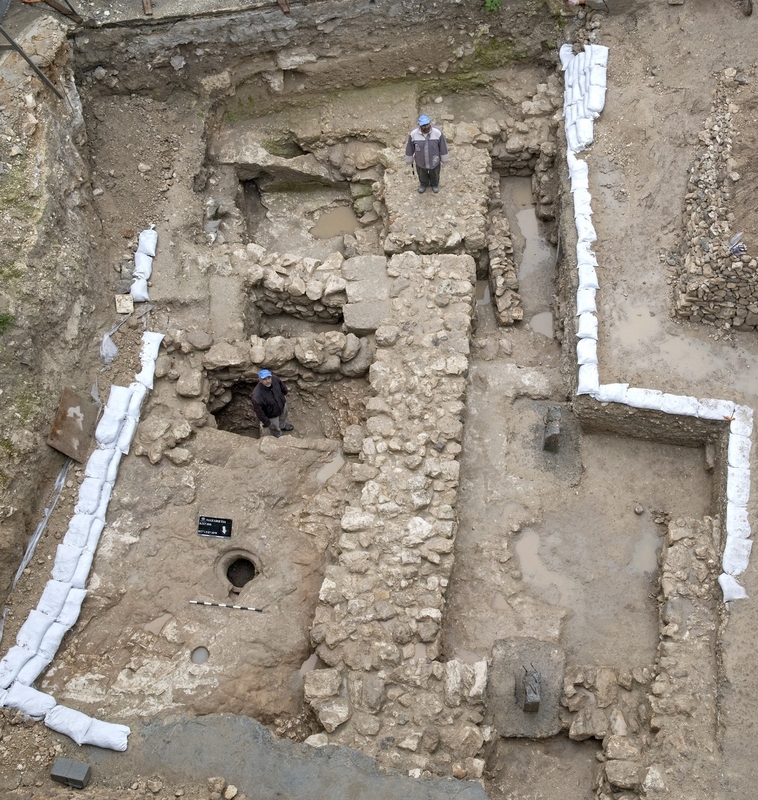 New digs at Jericho by the Palestinian Archaeology Authority were rather interesting. They have exposed a massive “outer wall” defense structure in an area that no one thought possible. It is certainly adding a new wrinkle to the great story of Jericho. Going up to Jerusalem has for many of the team members a fresh meaning. We travel from the lowest point on earth (approximately -1400 feet below sea level) to an elevation of +2500 feet in the City of God. The change in atmospheric pressure from the Dead Sea to Jerusalem effected a few. We have been soaking in as many biblical passages as we can, often reading aloud significant segments to highlight biblical background. Now we await for Easter! What an honor to be in Jerusalem at this time. We will join with tens of thousands tomorrow to celebrate the sine qua non of the Christian faith- The Resurrection- without that historical event we are done for! Thank God for the power of the Resurrection. Arrived safely in Israel with a team of fifteen (15) ranging in age from eleven (11) to eighty-one (81). The group is so excited to get started on the study tour. I did notice several differences on this trip to Israel. For the first time in any flight I’ve ever taken to Israel the pilot announced a new security requirement for in-bound flights to Tel Aviv. Every passenger was required to be in their seats and buckled in by the time the plane was thirty minutes (30) from landing in Israel. I guess this was an effort to monitor the rather free-about souls that would be wandering all over the aircraft in the past! There were no Visa forms or entry cards to fill out on the plane either. We just landed, went through customs, claimed our baggage and out the door to the awaiting bus. One hour later we were walking on the Med. I must report that it didn’t take long to realize that the American economy is in serious trouble. Israel’s base economy is keyed to the dollar. The rate of exchange last July 2007 when I was here on a dig was 4.2 shekels per dollar, now its 3.1. This is causing great concerns for everyone here in Israel. I hadn’t realized that our economy had this type of impact globally. I know we are paying nearly $3.25 per gallon for gas but that is nothing like what we may see in the months ahead. May God give us all the wisdom and grace to begin doing what we ought to have been doing- living all along… within our means. This is the first post to my newly created Weblog. It is also the day before I leave on an archaological study tour of Israel. I’ll be leading a wonderful team of 14 folks, from different backgrounds, religious affiliations, genders and ages. We will join famed Israeli archaeologist, Shimon Gibson for two days of excavation on the Mt. Zion Project (www.digmountzion.com) as part of our time in Israel. I thought as a way to “learn the ropes” of becoming a good webloggernaut I’d post something of a Travelog Plus over the next 10 days. Why not joins us for the virtual tour? I’d love to read your comments and postings too. If you have specific questions relating to the sites and comments that I will be posting…please post them and I’ll do my best to answer as many Q’s as time will allow.